Spend a Day in Wendell, N.C.
Wendell, N.C. (just 25 minutes east of downtown Raleigh), was settled in the 1850s by farmers looking for more fertile land for their crops. Today, the town still has a tie to agriculture with many of the local businesses supporting those community&apos;s farmers. Boasting the motto, "Small Town, Big Charm," Wendell is a fun day trip for visitors looking to wander the historic downtown Main St., explore and relax at one of the parks or enjoy some delicious food and drink. Get your caffeine buzz on at 41 North Coffee, located on Main St. Founded by a N.C. native, this coffee shop is a prime spot to kick off your morning in Wendell. Sip on a cup of Vietnamese coffee, one of 41 North Coffee&apos;s newest offerings, which is perfectly balanced with sweetness and a rich flavor. After you have a cup of coffee in hand, walk down the street to Brown Bag Bagels. The pumpernickel, bacon cheddar and rye bagels are crowd favorites, and they&apos;re made fresh every morning. Wendell&apos;s Main St. is lush with trees, and lots of the businesses have porch swings, adding to the welcoming, relaxed Southern vibe of the town. After your breakfast, stroll down Main St., which is recognized on the National Register of Historic Places. Look out for events hosted on Main St., including the Wendell Harvest Festival (Oct.), Wendell Wonderland (Dec.), Spring Fling (May) and International Food and Music Festival (Sept.)! Stop in few of the boutiques and antique shops down Main St. The Wendell General Store is a great place to pick up fun gifts for friends and family. Also, get a few sweet treats from Chocolates by Whitney. The chocolate-covered strawberries are must-try! Antiques? Head into Wendell Antiques & More to peruse old records, shop interesting furniture and grab a few bars of craft soap and locally-made crafts. After a busy morning of shopping, it&apos;s nice to kick back and relax on their front porch for a bit. 1903. is another can&apos;t-miss, with anything from home decor to baby gifts and everything in between! All of that shopping is bound to work up an appetite! One of the classic, old-school restaurants to visit for lunch in Wendell is Aubrey&apos;s and Peedie&apos;s Grill. Known as the town&apos;s go-to for hot dogs and burgers, the grill is often packed with locals. Afterwards, take a short drive to Roberston Millpond Preserve (pictured in header and below). 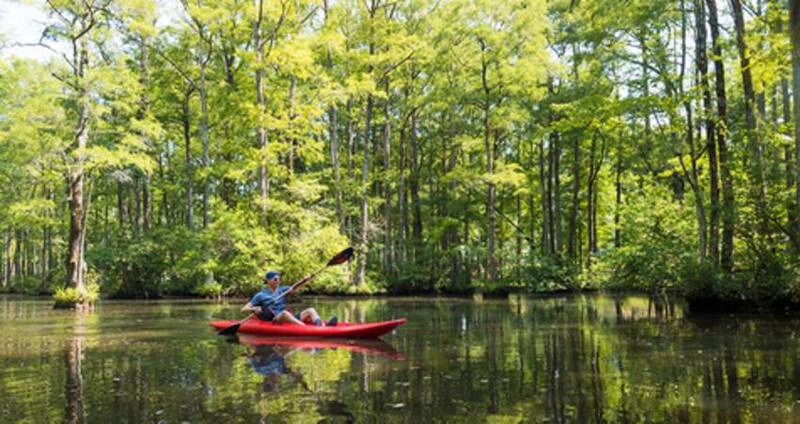 This hidden 85-acre refuge for nature lovers, canoeists and kayakers is a highlight in Wendell. Opened to the public in 2015, the blackwater swamp property is the only bald cypress habitat in the Raleigh area, creating the unique experience of paddling through a forest-like setting. Open on weekends and some holidays, the preserve&apos;s 1.15-mile loop paddling trail (marked by more than 70 buoys) is the main draw for canoists and kayakers. On Saturdays from April-Oct., Paddle Creek, a private rental and guide company, has solo and tandem kayaks available for hourly rentals. And a parking and launch area allows you to bring your own canoe or kayak as well for no fee. Check out a few more tips for visiting on our Guide to Kayaking, Stand-Up Paddleboarding, Canoeing and More in Raleigh, N.C.
Another option for the outdoors is Wendell Park, with beautiful walking trails, disc golf, tennis, basketball, a playground for the kids and a dog park. Once the sun starts setting, it&apos;s time to kick back with a drink! Visit Oaklee Distilling Co. for a tour of downtown Wendell&apos;s distillery. Try a sample of the Boots Vodka Troop Strength, which is distilled using agricultural products like sweet potatoes from nearby farmers. Tours are available on the third Thurs. of each month, 5-7:30pm. Also, plan to stay a while at Wine and Beer 101. This local wine and beer shop offers tastings on Fridays, 5-7pm, and Saturdays, 2-5pm. Located less than four miles from Main St., hop in your car for a short drive to Grounds Café at The Farmhouse at Wendell Falls. This quaint cafe offers a neighborhood feel with a relaxed atmosphere and some of the best sandwiches around. On Fri. evenings stick around for live music! Try the "Justin" sandwich, which features pimento cheese and bacon or opt for the tacos of the week served with chips and salsa. Order up a locally-brewed beer or glass of wine. Enjoy your meal and libations outside on the shaded patio to close out your day in Wendell! Learn more about Wendell here!